Every June Cisco releases its latest five-year rolling forecast on internet traffic growth, and this year is no different. Now in its eleventh year, the Visual Networking Forecast (VNI) tracks internet growth, underpinned by growing internet users, IP-connected devices, network traffic speeds and data-rich applications. This year, the report highlights a critical milestone in the internet's overall development: for the first time, the VNI is forecasting over 4 billion people will be using the internet by 2020. But despite global progress in surpassing this threshold, there will still be billions of people who are not benefiting from digital connectivity. By the end of 2016, total global internet traffic will surpass one zettabyte. In terms that we may be more familiar with, one zettabyte is equal to about one trillion gigabytes. By 2020, that figure will more than double as total internet traffic will reach 2.3 zettabytes. While forecasting such large numbers is incredibly complex, historical growth rates have been within 10% of their forecast; the 2011 forecast for the 2010-2015 period was even closer (31.8% growth forecasted versus the actual growth rate of 31.6% for that time period). One significant factor in this growth is the increase in internet users: over 1.1 billion new internet users will be connected, rising from 3.0 billion in 2015 to 4.1 billion in 2020. So where are all of these new internet users connecting? The majority of new internet user growth will occur in low and middle-income countries in Asia where nearly 700 million new internet users will connect. This growth is primarily driven by India and China, where over 276 million and over 238 million users, respectively, will connect. But other countries in Asia will see significant internet user growth, such as in Indonesia, where over 87 million people will start connecting to content and services over IP-networks. As a region, Africa and the Middle East has the fastest growing population of internet users with a compound annual growth rate (CAGR) of 10.8%. Over 178million new users will connect in the region. Central and South America will also see a substantial rise, with over 109 million new users connected over the five-year time period. In high-income countries, the majority of populations are already using the internet. 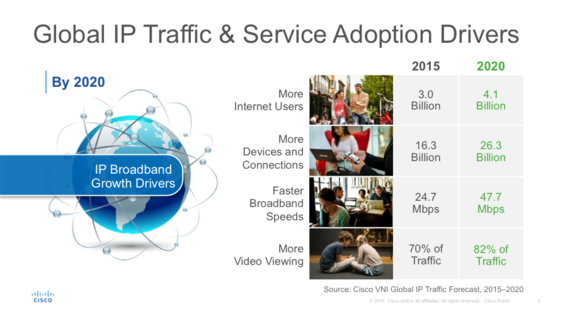 The VNI forecast points to a current adoption rate of 89% in North America and 81% in Western Europe. There are, however, significant pockets of people that are not able to access reliable high-speed internet service in high-income countries. The US stands out in this regard as over the 2015-2020 period, another 23 million people will be connect to the internet for the first time. Despite the progress being made in global connectivity, by 2020 there will still be over 3.6 billion people not using the internet, the majority of whom will be lower income and/or in rural areas. For the majority of these 3.6 billion people, internet service will be unaffordable or internet service providers may not find it commercially feasible to build access infrastructure in their regions because low economic returns to their investment. This lack of connectivity will further exacerbate existing inequalities for the economically disadvantaged as previous research has highlighted how digital technologies may contribute to rising income inequality within countries. 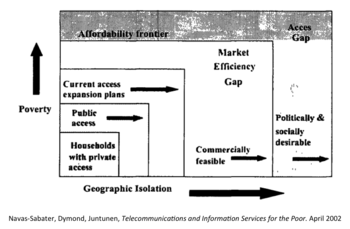 This forecast of 1.1 billion new people connecting to the internet over the next five years reflects growth that is bounded by what Navas-Sabater, Dymond and Juntunen noted in 2002 as the frontier for "current access expansion plans." Further growth may be 'unlocked' by pro-adoption market reforms, policy to counter market-failure and coordination in financing all to increase market efficiency in the rollout of commercially sustainable network infrastructure. Beyond a notional 'market efficiency frontier', direct public investment may be needed to reach, what Navas-Sabater, et. al. noted as, "areas and groups that cannot be reached commercially, even in the most efficient markets, without some form of [public] intervention." 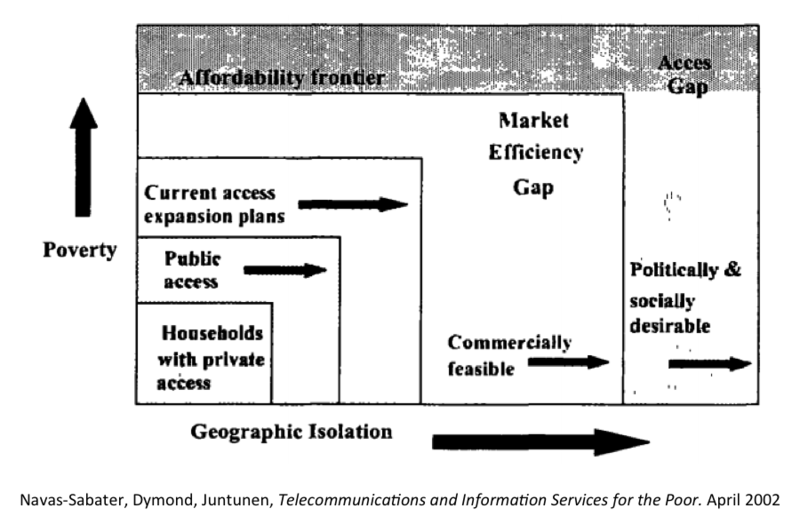 Navas-Sabater and his co-authors noted that efforts to close the market efficiency gap and the affordability frontier/ access gap are most effective when implemented in parallel, taking care that "access gap policies do not preempt perfectly viable market-based solutions." Global efforts to accelerate internet user growth are focusing on both addressing market reforms in order to encourage commercial network expansion, as well as more direct public investment and effort to counter affordability and access issues. For example, the Alliance for Affordable Internet (A4AI) is a global public-private partnership focused on building local in-country multi-stakeholder coalitions that advocate for policy and regulatory reforms to "unlock technological advances, reduce the cost to connect, and enable universal access." A4AI is active in a number of countries and regions, including the Dominican Republic, Ghana, Liberia, Mozambique, Myanmar and Nigeria. The World Economic Forum's Internet for All program is also focused on accelerating internet adoption by focusing on public-sector policy and regulatory barriers to greater network expansion, as well as coordination on infrastructure investment and support of other technological solutions. The US State Department's Global Connect Initiative is a global effort to focus attention on the policy barriers to internet expansion, particularly the high levels of taxation on the internet services and devices. The Initiative is coalescing partners to accelerate internet adoption with the goal of connecting 1.5 billion more people to the internet by 2020. These efforts, among many others, are crucial to ensuring that the opportunities that internet connectivity provides are available to all segments of the global population. Because the internet is a key driver of income and economic growth, those without access are at a disadvantage. Efforts to close the access gap are needed to ensure inclusive growth and economic opportunity for the all.